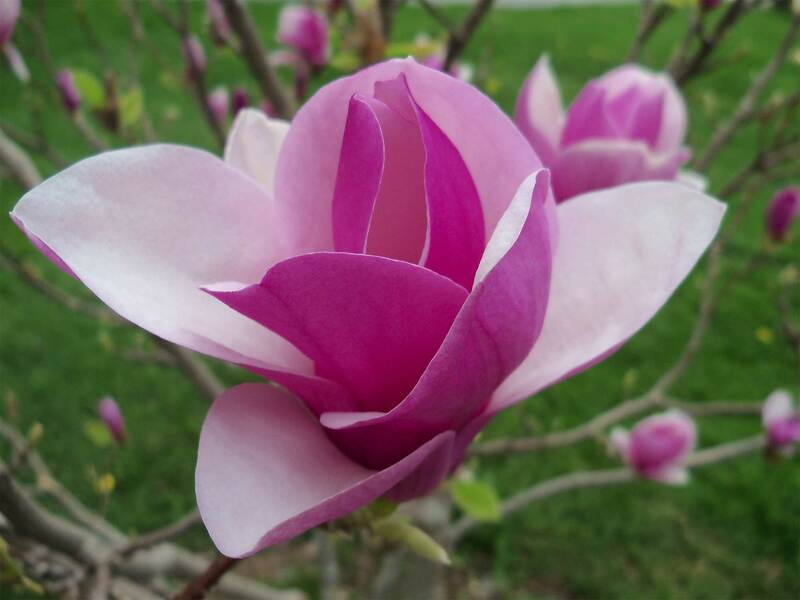 Picturesque Annapolis Royal, “Nova Scotia’s Magnolia Capital”, is planning to showcase its fifth annual “Celebrate Magnolias” this weekend, and the “Inspired by Magnolias” art show is in full swing at ARTsPLACE through June 3. With each passing year, the hundred plus beautiful and fragrant magnolias are getting more mature, and new ones are being planted. The earliest started blooming this year in early April, and other species blossom at different times into June. The Historic Gardens will be open this Saturday and Sunday, May 12 – 13, from 9 – 5 p.m. with admission by donation. On Saturday morning, May 12, the last Winter Market of the season will be held at the Gardens from 9 a.m. – Noon. There will also be a guided Magnolia Tour at 10 a.m. with tree expert, Angelika Waldow, and a special private garden will be open from 10 a.m. – Noon. (Angelika also took this beautiful feature photo of the Magnolia Soulangeana Rustica Rubra, and we appreciate her sharing it with the Explorer Guide.) The third annual Rare and Unusual Plant Sale will be held from 1 – 4 p.m at the market square. Be sure to come early as this is a very popular and busy event. On Sunday afternoon, May 13, 1 – 3 p.m., the Historic Gardens will provide soup and baguette and a special talk by magnolia expert, David Veinotte. At 3 p.m. enjoy a Guided Magnolia Walk with horticulturist, Karen Achenbach. A Self Guided Magnolia Tour is also available. For even more events, and updated schedule and tickets contact the Historic Gardens, 532-7018, www.historicgardens.com or “Annapolis Royal Celebrates Magnolias” on Facebook. This entry was posted in Explore Annapolis Royal, Gardens, Tours, Weekly Updates and tagged Annapolis Royal, Annapolis Royal Nova Scotia, Celebrate Magnolias, Explore Annapolis Royal, Historic Gardens. Bookmark the permalink.